PISSOF and ZITs column routed by ZSA Alliance. Enfilade fire from Setumsian TARTs (left) caused massive casualties among the attacking ZITS and PISSOF troops. A strong column of troops from the Petramco International Security Service Overseas Force (PISSOF) supported by religious fanatics from the Ztumsian Independent Tribal Spiritualists (ZITS) were routed last week after they attacked a weak Ztumsia-Setumsia Alliance (ZSA) force on the Setumsian border. High on JuJuJuice and convinced of their own invincibility the ZITS commanders threw caution to the winds and launched an all out infantry assault on ZSA troops in defensive positions protecting a Radio Setumsia transmitter and the village of Lagao, a target of great strategic importance located close to the junction of Highway 19 and Highway 1. 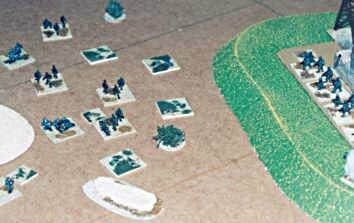 ZITS and PISSOF troops were shot to pieces as they advanced across a plain and their assault soon ground to a halt. 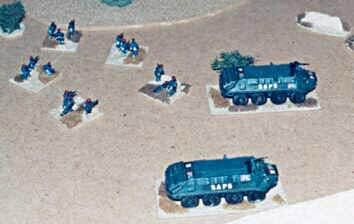 The PISSOF commander blindly followed the ZITS' example and his infantry joined in the attack, only to be decimated by frontal fire from ZSA armour and enfilade fire from Setumsian police, one of their Tactical Armed Response Teams (TARTs) who were defending the radio transmitter. 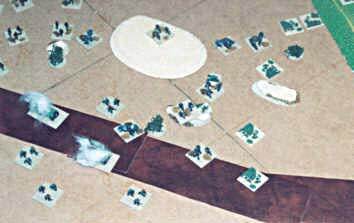 Several units of PISSOF militia and ZITS regulars routed under the withering fire of the ZSA defenders and the whole infantry assault ground to a halt. As this assault stalled a unit of ZITS reinforcments arrived and a column of armoured cars and technicals mounting AA guns stormed up Highway 19 at a high speed. 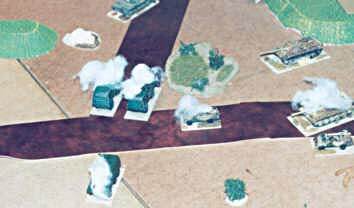 They seized the strategic crossroads, but were almost completely destroyed by a counterattack launched by a ZSA unit of tanks and technicals from the People's Army for the Nation and Tribes of Ztumsia (PANTZ). Ztumsian SAPS (Special Armed Police Service) reinforced the ZSA forces but took little part in the battle. As night fell skirmishing continued elsewhere on the battle field but the whole area was clear of PISSOF and ZITS forces by early the next morning. The Head of Security for Petyramco's African Division has been replaced for ther ninth time in as many months.